CCM Ribcor 50K Senior Hockey Skate | Sports Etc. PUMP™ The Advanced Pump ™ is our most efficient Pump™ to date for personalized fit with added comfort..
QUARTER PACKAGE The Ribcor Elite technology has enhanced pro ribbed reinforcement which harnesses flexion for maximum power in every push. CORE Heat-moldable FlexCore is a lightweight and thermo-formable core for maximum comfort and reactiveness. LINER SR: Dual zone with tacky nash and Clarino JR: Dual zone with Duratex Grip and Nash Keeps feet dry and enhances heel lock with maximum durability at the top eyelets. MIDSOLE The composite midsole has lightweight support for enhanced blade to boot interface. OUTSOLE The carbon composite outsole has a lightweight structure that maximizes energy transfer. FOOTBED Griptonite reduces foot movement to increase energy transfer. HOLDER SpeedBlade 4.0, to increase attack angle providing greater strides and cornering. RUNNER SpeedBlade Black is treated for a longer edge life and resistance to corrosion. 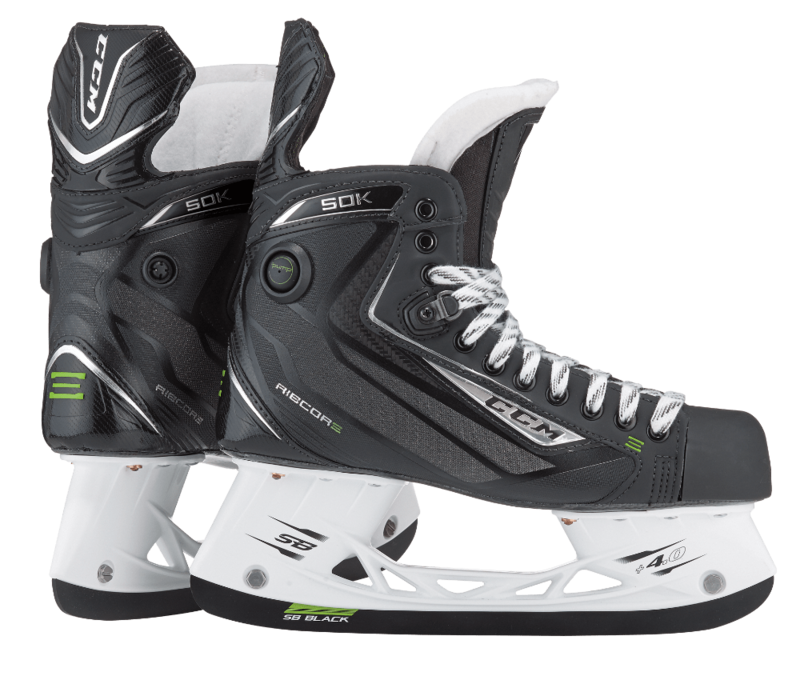 The CCM Ribcor 50k skates has an all new Pump™ technology, which allows for fewer pumps with a re-engineered shape to help provide a more customized fit and maximum heel lock. 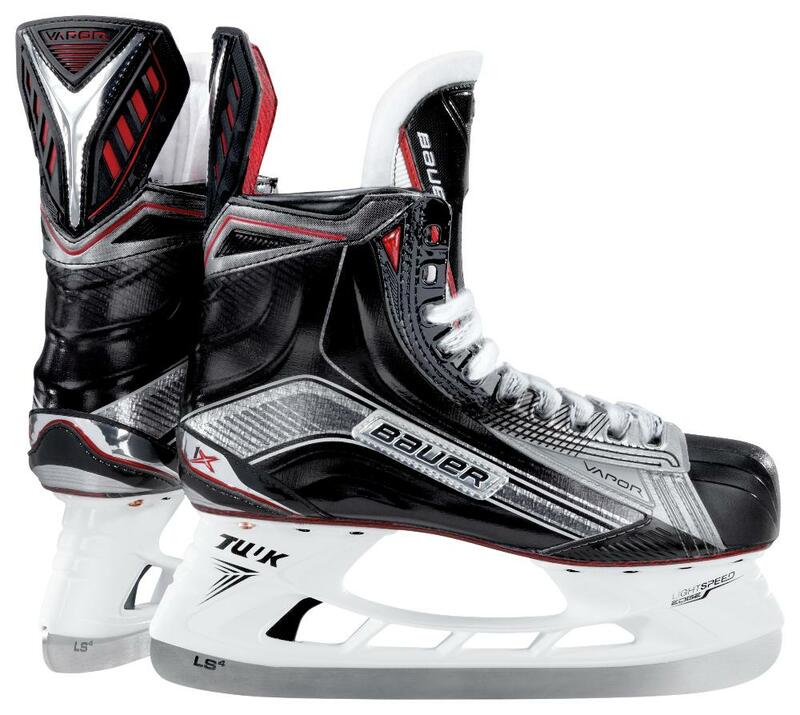 The ribbed exterior design of the skate boot links the stiff carbon inserts to the flexible composite materials. The result is a feel that allows for natural agile maneuvers while still providing exceptional support. The blade’s black coating hardens its surface, giving skaters a biting edge to break away from opponents. CCM Ribcor Fit– Cut narrower through the heel and forefoot than other Reebok/CCM skates, but still fuller than many other brands. Tapered ankle for a snug and secure fit. Recommended for regular feet. Currently one of the best fitting skates out of the box. Sports Etc Performance To Value Rating– 9 out of 10- For a pro-level skate, this might be one of the best values on the market today. Recommended for skaters at a higher level looking for a snug, locked in fit through the heel and ankle.